There comes a point in the writing life of any poet (let’s not use the word ‘career), when their (published) work changes, if not develops. As a well-travelled Aussie ex-pat who has lived in Paris and London, Katherine Gallagher has a lifetime’s experiences to draw on. This book’s 5 sections take the reader through a selection of these in the often spare and understated style for which her work is known. Anyone seeking the vibrancy and drama of say, Ruth Padel or Pascale Petit should look elsewhere. emptying into the moment, rinsing clean. This is contrasted with a frankly postcard poem, and ‘Quotidian’ which uses a line by Mahmoud Darwish, ‘we love life wherever we can’ to good effect as a refrain. and found again on Bexhill beach. wedded to her days, made hers. its folklored history, an inheritance. voyaging them on beyond boundaries. of last-minute angst, last chance? The departure from the conventional 5-7-5 either needs no explanation or could have been relegated to an end note at the back of the book. ‘The Dream is the Ocean’ is a more ‘New Age’ type of poem, which achieves a balance between repetition and moving on, in seven couplets, although printed as one stanza. The Dream is the ocean. carved their name on or the date. in this wild place you dream of coming to. be the hope of your being. native plants - boronia, heath. beneath a theatre of stars. 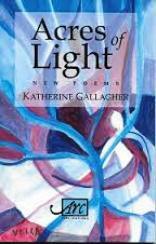 What a fine ending for this rewarding book, where Katherine Gallagher’s life-experience has allowed the reader to share part of her journey. You know what I’m going to say now; go into that bookshop and buy your ticket. Anything Can Happen	District Six Museum, Cape Town. By Barbara Lewis.